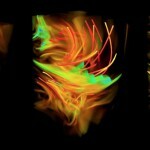 These are some images of hydrodynamic turbulence (click on the images to see them at full resolution). Most are from numerical simulations using up to 20483 grid points and were published in 2005 and in 2008 (see also the references therein). 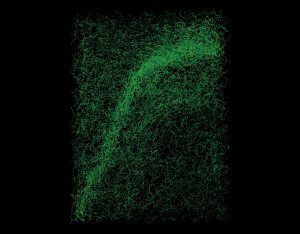 One of these images was used by Ian Stewart in his book “Visions of Infinity: The Great Mathematical Problems” to illustrate the complexity of a turbulent flow. 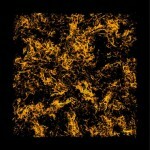 Effect of increasing resolution and Reynolds number in simulations of hydrodynamic turbulence. 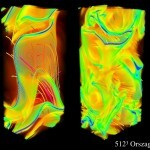 3D rendering of vorticity in a 2048^3 simulation of hydrodynamic turbulence with Taylor-Green forcing. 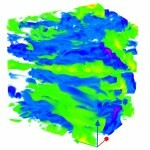 Small scale vortex filaments (with velocity field lines in red) in hydrodynamic turbulence with 2048^3 grid points. 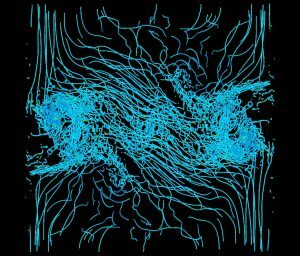 Vortex filaments with velocity field lines in a simulation of isotropic and homogeneous turbulence. 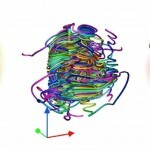 A vortex filament in a simulation of isotropic and homogeneous turbulence. 3D rendering of vorticity and of helicity density in a 2048^3 simulation of hydrodynamic turbulence with zero net helicity. 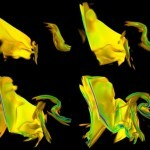 3D rendering of vorticity in a 1024^3 simulation of hydrodynamic turbulence with Taylor-Green forcing. 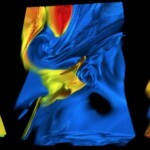 3D rendering of vorticity in a 1024^3 simulation of hydrodynamic turbulence with ABC forcing. 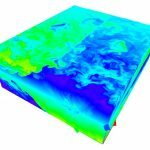 Rotating and stratified turbulence develops slanted layers in the velocity and the temperature fields (and pancake-like structures in the absence of rotation). 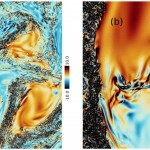 Below are some images of simulations of stratified turbulence, published in a recent paper in Physics of Fluids, and in another paper in 2014. 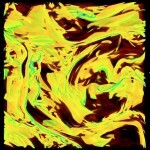 Cover of Physics of Fluids with vertical vorticity in a 4096^3 simulation of rotating and stratified turbulence. 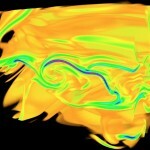 Vertical vorticity (with a zoom on the right) in a 4096^3 simulation of a rotating and stratified flow, with parameters corresponding to the southern abyssal ocean. 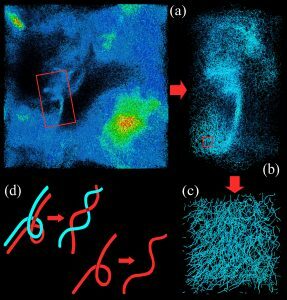 Temperature fluctuations in a simulation of rotating and stratified turbulence at moderate resolution. 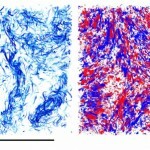 Temperature fluctuations in two simulations of rotating and stratified turbulence, with varying intensity of rotation. 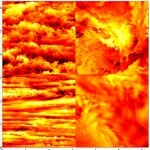 Temperature fluctuations in two 2048^3 simulations of stratified turbulence, with weaker stratification above, and stronger stratification below. Formation of a sharp front in temperature in a simulation of the Boussinesq equations in a thin domain using 2048x2048x256 grid points. Flows in a rotating frame transfer energy preferentially towards two-dimensional modes, developing strong anisotropy and column-like structures. 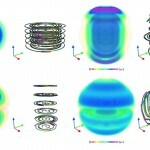 The images below were rendered using data from simulations with up to 15363 grid points, and compare the effect of rotation in helical and in non-helical flows. Recently we also studied the recovery of isotropy at small scales in a simulation or rotating turbulence at very large Reynolds number, using 30723 grid points. 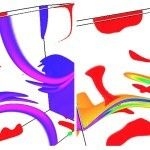 Images from these simulations were used by Peter Davidson in his books “Turbulence in Rotating, Stratified and Electrically Conducting Fluids” and “Turbulence: An Introduction for Scientists and Engineers (2nd Edition)”. 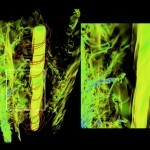 Vorticity intensity in a 1536^3 simulation of a helical rotating flow, with a zoom on the right. Red lines correspond to the trajectory of fluid elements. 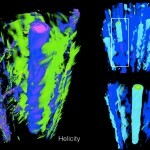 Helicity density (left), and vertical velocity (bottom right). The entire box is shown in the top right corner. 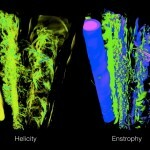 Comparison of helicity density (left) and enstrophy intensity (right) in a simulation of rotating helical turbulence. 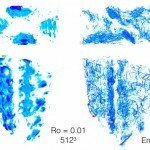 Energy and enstrophy density in a simulation of non-helical rotating turbulence at moderate resolution. 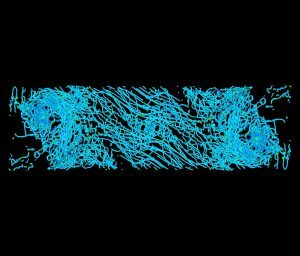 Quantum turbulence is the chaotic and erratic spatio-temporal behavior observed in superfluids and Bose-Einstein condensates. Recently, we were able to extract the spatio-temporal spectrum of Kelvin waves from simulations of the Gross-Pitaevskii equation. With Marc Brachet and Patricio Clark di Leoni we also performed multiple simulations of quantum turbulence using 20483 and 40963 grid points to study the evolution of helicity in the flow, and its cascade towards small scales. 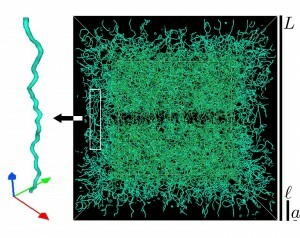 Quantized vortices in a simulation of a Taylor-Green flow using the Gross-Pitaevskii equations. 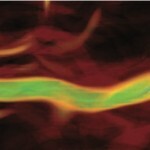 Kelvin waves can be identified propagating along the vortex filaments. 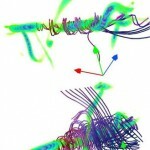 Tangle of quantized vortices in a 2048^3 simulation of helical quantum turbulence with ABC initial conditions. A large-scale vortex formed by small-scale quantized vortices in a 2048^3 simulation of the Gross-Pitaevskii equations. Cascade of energy in quantum turbulence, from large-scale structures to the excitation of Kelvin waves, and dissipation into phonons. 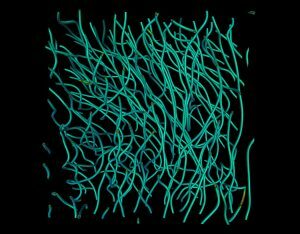 Quantized vortices in a 4096^3 simulation of a Taylor-Green flow. The initial conditions mimic the flow between two counter-rotating propellers as used in some experiments. Zoom into the shear layer in a Taylor-Green flow in a simulation using 4096^3 grid points. The magnetohydrodynamic (MHD) approximation can be used to study conducting flows in planetary cores and large-scale plasmas in the interplanetary and interstellar medium. 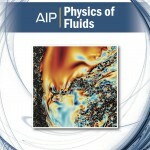 In these plasmas, study of small-scale processes require two-fluid approximations, or kinetic plasma descriptions. 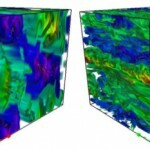 We performed multiple simulations of MHD flows, to study turbulence with resolutions of up to 15363 grid points, and to study the development of current sheets and magnetic field reconnection with resolutions of 40963 and 61443 grid points. Current sheets in a 1536^3 simulation of MHD turbulence with helical initial conditions. 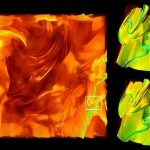 Folded current sheets in a subvolume of a 1536^3 simulation of MHD turbulence. 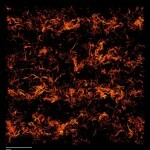 Current density in the full domain of a 1536^3 simulation of MHD turbulence, and detail of current sheets at small scales. Time evolution of a small-scale current sheet in a simulation of MHD turbulence using 1536^3 grid points. 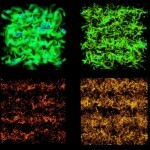 From left to right, current density, magnetic helicity, and cross helicity in a small-scale structure of MHD turbulence. 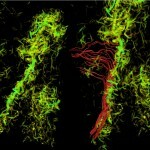 Small-scale structures in a simulation of MHD turbulence with helical initial conditions. Development of current sheets in a simulation of an Orszag-Tang vortex. 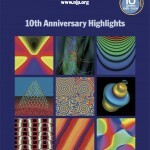 Cover of the 10th Anniversary Highlights of NJP, with renderings from some of our simulations. Current density and magnetic field lines in a 2048^3 simulation of an ideal MHD flow. Vorticity and current density in a 4096^3 simulation of an ideal MHD flow. Spherical containers are interesting for many astrophysical and geophysical applications. Using a purely spectral code, we performed multiple simulations of hydrodynamic and MHD flows in rotating spherical vessels. 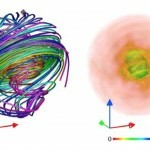 Although purely spectral methods are computationally expensive, the high accuracy and conservation of the method allowed us to study the long-time dynamics and statistics of planetary-like dynamos, including a comparison of magnetic field reversals stemming from the numerical simulations with data of terrestrial magnetic field reversals. 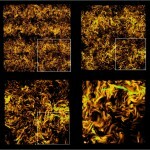 Evolution of a flow from the initial condition (left) to the turbulent regime (right). Velocity field and energy density in a hydrodynamic flow in a rotating sphere. Velocity (left) and magnetic fields (right) in a dynamo in a rotating sphere. 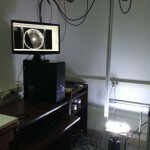 Recently, with Pablo Cobelli we started building a laboratory to study geophysical turbulence and wave turbulence. 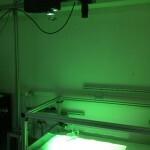 The laboratory already has a tank to study surface wave turbulence, and several fast cameras to do surface profilometry. The first paper using only data from our laboratory was published in 2015. Gravity-capillary waves excited by wave makers in the surface of water. 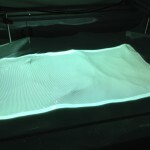 Experimental setup to measure surface deformation. An experiment to study walking droplets in a vibrating plate.